Where can you meet multi-millionaires, employees from the NYSE and students while practicing your Spanish? Try Sophie’s Café! Located only steps from school, you will find an abundance of Cuban food. 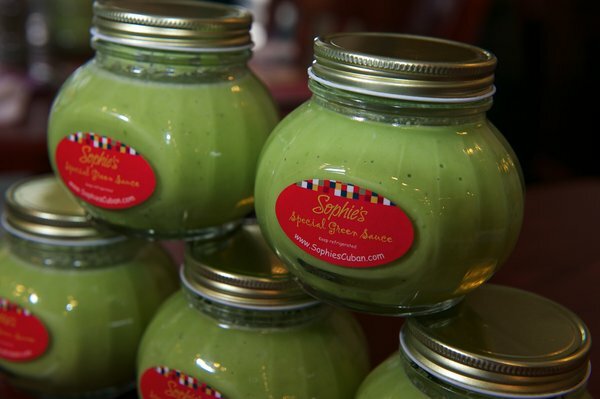 Sophie’s is only a minute walk towards the end of the block—there is no way you can miss the café’s yellow flag and the crowd of people walking in and out of the doorway. Once you enter the smallish restaurant (and I use the word smallish here to note that it is not a hole-in-the wall, but with the crowd of people, you almost feel like you are on a subway with good food surrounding you). There is a narrow path once you enter the doorway and bypass the crowd of people leaving happy, with food in hand. You have three options: you can choose to sit down and dine, stand in the hot buffet food line or in the fresh-pressed sandwich line. Don’t be confused though; it appears as if there is only one line for both the sandwiches and hot food, but this is false. Use your analytical skills and determine where the sandwich line ends and the hot food line begins. Now that I have forewarned of the hazards of the food line, let’s talk about the restaurant’s authenticity. First: the music. While you can still manage to hear the Spanish salsa tunes above the noise of the people dining and employees working, the music is not too loud. Second: the atmosphere. Spanish décor line the walls and colorful menus cover every table (although you will probably notice that most of the tables are crowded with diners). Third: the language. I would also go so far as to recommend that you would do well to know Spanish. It makes for hassle-free ordering. Since I enjoy Cuban sandwiches, I decided to try Sophie’s Cuban sandwich. Unfortunately, at $7.99, the price was steep for only a sandwich. I also strongly believe that a Pressed Cuban should comprise crusty bread with ham, cheese and pickles in abundance. The bread was too soft. And the pickles were scarce. I was also shouted at for taking a small cup to put the deliciously spicy verdé sauce into since we chose to eat at the school. Admittedly, they did provide you with two TINY cups of sauce measuring about a tablespoon, but that isn’t enough for a whole sandwich (especially if I am paying over eight dollars…and they charge you for additional sauce). Finally, I usually prefer not to be shouted at…but maybe that’s just a personal opinion. I had visited Sophie’s once before and dined in—the sandwich was $1.50 less, the bread was crispier and the sauce was provided in a bottle on the table. In addition, I tried the fried plantains. Sweet and tender, the fruit melted in your mouth. If you enjoy Cuban food, you might be happy unloading your wallet for one sandwich, but otherwise, I might give the hot buffet line a chance and share the meal; they are $9.99. I shouldn’t disregard the other food items they have for sale, but I can live without Sophie's.